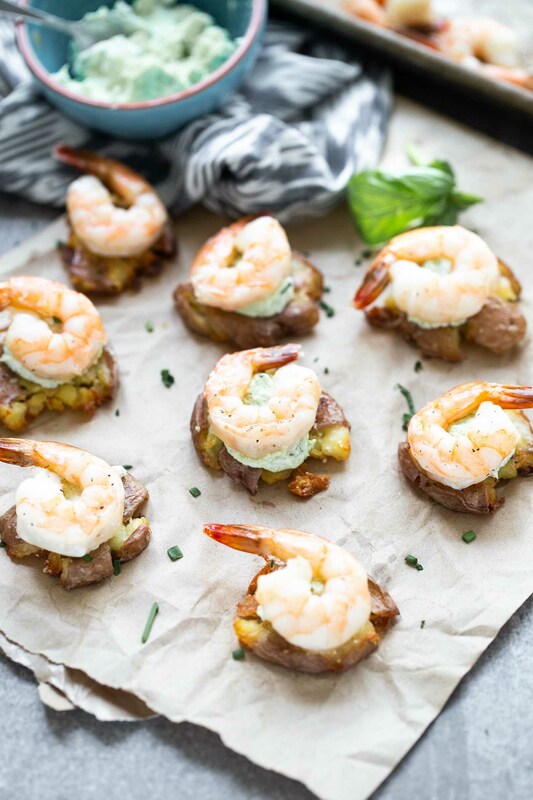 These Crispy Smashed Potatoes with Green Goddess Goat Cheese and Shrimp are crazy elegant, crazy delicious and belong at your next event! I could live off finger foods. Tiny pigs-in-a-blanket. Crispy blue cheese-stuffed olives. Adorable wonton tacos. And today’s Crispy Smashed Potatoes with Green Goddess Goat Cheese, just to name a few. I don’t know what it is about being able to shameless pop something into your mouth versus using a fork and knife, but to me, things just taste better when they’re presented in a pretty little package. Plus, forgoing cutlery kind of brings out the kid in all of us, doesn’t it? Finger foods also tap into my obsession to develop creative party food that doesn’t involve packaged meatballs swimming in a pool of barbecue sauce or shrimp cocktail straight from the freezer section. Even though there may be a tiny bit more effort involved, for me, it’s worth it. And I’m guessing since you’re here, it’s worth it to you as well. Hurray to my like-minded food peeps! 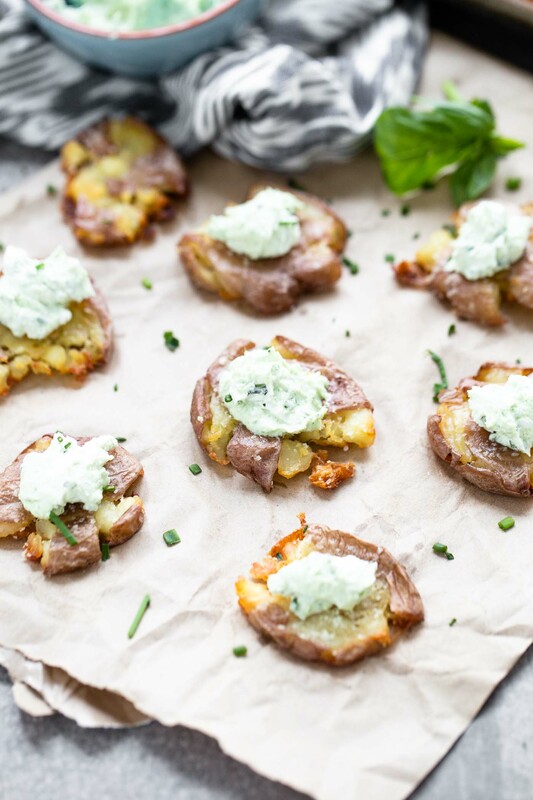 We have been completely infatuated with a variation of these crispy smashed potatoes for years, except instead of serving them as an appetizer, they typically serve the purpose as the starchy side every time we grill steaks or have some sort of meat and potatoes type of meal. It wasn’t until I had the idea for these crispy Greek-style smashed potatoes a few years back that they started doubling up as a vessel for some of my favorite flavor combinations. 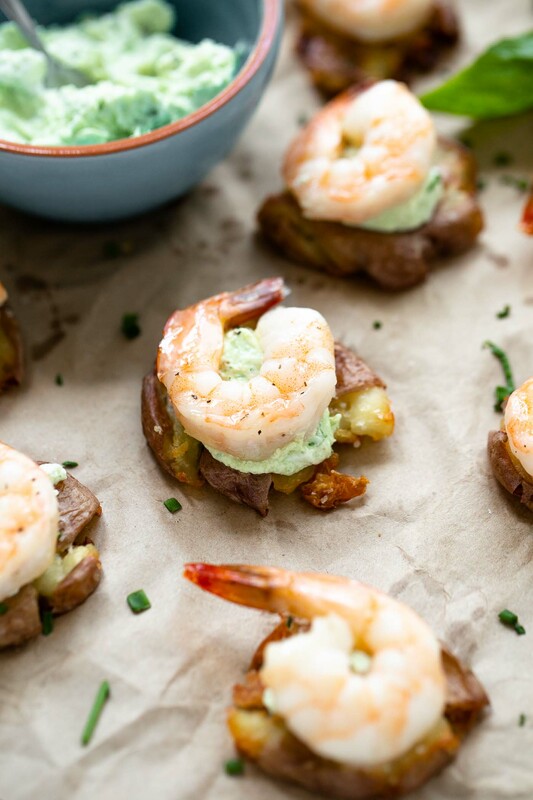 This version kind of reminds me of a play on canapés, with the crispy potato playing the role of the base in lieu of bread or a cracker, the green goddess goat cheese acting as the go-to crème fraîche, and the shrimp replacing the smoked salmon. I wish I could take all the credit for the method I’ve used to roast the potatoes, but it actually comes from a Food Network episode I saw YEARS ago, from Claire Robinson. Her version uses the oven to cook the potatoes from start to finish, but I like the idea of shaving a little bit of time off the cooking process, so I started out by boiling the potatoes in water, and then let the oven crisp them up. The key to making them super crispy is to make sure each potato is completely devoid of moisture once they come out of the boiling water, cook them at a high temperature (400 degrees will do) and use plenty of oil. The recipe calls for three tablespoons, but if halfway through baking you see they need a little more, go ahead and give them an extra drizzle. You REALLY want them to be super crispy, so if they need a few more minutes in the oven than the recipe states, keep them in there, the crispy texture is really what makes these special. Ok, now for the best part. The Green Goddess Goat Cheese. Well, actually I hate to say that it’s the best part, because the potatoes themselves are SO good and so crispy, and really, the package as a whole is just so delicious. But this goat cheese, this something I could put on just about anything. It would be awesome as a spread on top of a burger. It would be so delicious stuffed into little peppadew peppers for an even more bite-sized finger food. And it would be perfect smothered on crispy pieces of crostini. Really, the possibilities are endless. But of course, today, we’re dolloping the mixture on top of the crispy potatoes and them stopping each one with a plump shrimp that’s been roasting alongside the potatoes. Roasting shrimp has become my preferred method for cooking shrimp basically whenever I’m using shrimp. It only takes a few minutes, and as long as you don’t leave them in too long, they come out super plump, sweet and perfect every time. For aesthetics in the photos, I left the tails on, but if you’re serving these to your friends, don’t make them take the tails off themselves, chop them off before your roast them. My friends practically inhaled these, and I’m sure yours will too! Add potatoes to a large stock pot. Cover with water. Bring to a boil and reduce to a simmer. Cook until easily pierced with a knife or fork, about 15 minutes. Drain and pat completely dry. Once the potatoes are dry, toss with one tablespoon of olive oil. Place potatoes on a large rimmed baking sheet. Use the bottom of a measuring cup to gently smash all of the potatoes. 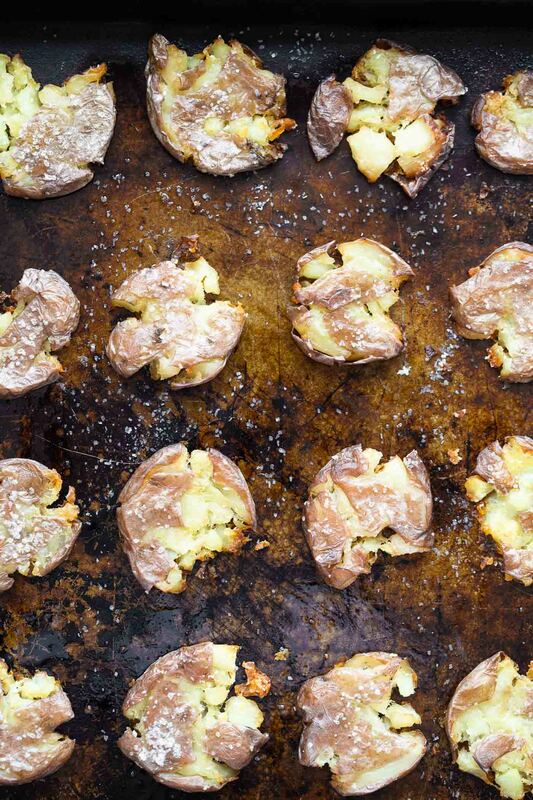 Drizzle the potatoes evenly with two tablespoons of olive oil. Season evenly with 1/2 teaspoon salt. Sprinkle conservatively with pepper. Bake potatoes until crisp and golden brown, about 35 minutes. When the potatoes are about 10 minutes shy of being done, toss the shrimp with remaining olive oil. Season with a little bit of salt and pepper. Scatter on another rimmed baking sheet and roast until pink and cooked, about five minutes. Remove from oven, set aside. 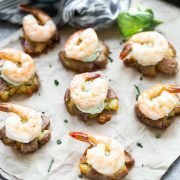 While the potatoes and shrimp cook, add goat cheese, garlic, basil, chives, tarragon and remaining salt to a mini food processor or blender. Blend until herbs are incorporated into the goat cheese (it should be green). Let the potatoes cool slightly and then top with a dollop of the goat cheese mixture. Top with a shrimp. Garnish with chopped chive. One Response to "Crispy Smashed Potatoes with Green Goddess Goat Cheese"